In flames but not consumed by fire, That’s the Unburnt Bush! 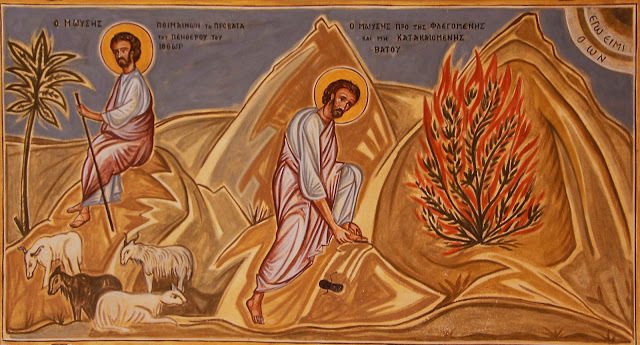 The Unburnt Bush is one of the most vivid biblical images. It has inspired many artists and writers. However, the icon of the Mother of God the Unburnt Bush is truly the most meaningful and all-encompassing image. If we recall that early Christians used to call icons the painted Gospel, the Unburnt Bush icon can be called the painted Bible because its images represent some narratives taken both from the New and from the Old Testament. 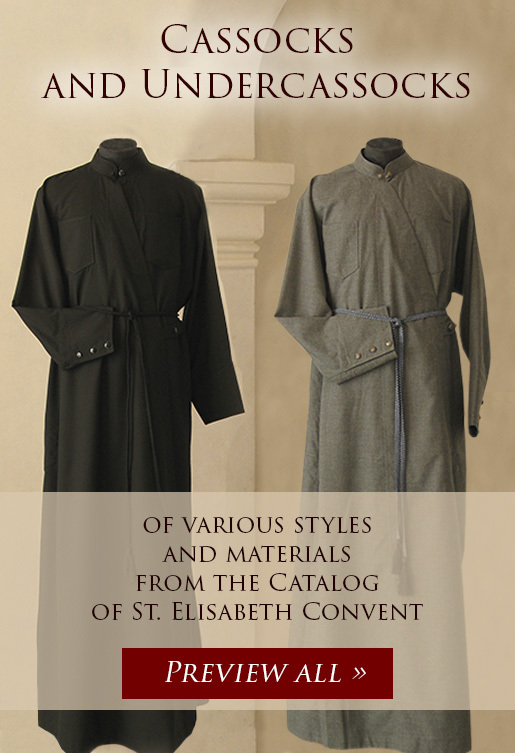 It belongs to the fourth, and the last, type of Marian iconography, the Akathist one. In other words, it illustrates a certain descriptive term used in the Akathist or other works of church poetry to characterise the Mother of God. This time, it points at the Old Testament prototype of Virgin Mary: the Unburnt Bush. The bush in question is referred to as Senekh, a thornbush, in Hebrew. According to the majority of biblical scholars, it belongs to a certain species of mimosa or acacia, which grows in the desert. Mount Sinai was covered with thornbushes to such an extent that its name in Hebrew, Senen, literally means “thornbush”. We read in the Old Testament that Prophet Moses came to Mount Sinai and saw a bush, which was burning but not consumed by fire, and heard God’s voice that told him to stay away from that bush and take off his shoes. Moses was standing on holy land. And the angel of the Lord appeared unto him in a flame of fire out of the midst of a bush: and he looked, and, behold, the bush burned with fire, and the bush was not consumed. And Moses said, I will now turn aside, and see this great sight, why the bush is not burnt. And when the Lord saw that he turned aside to see, God called unto him out of the midst of the bush, and said, Moses, Moses. And he said, Here am I. (Exodus 3: 2‒4). Although St. Clement of Alexandria regarded the unburnt bush as an image of Christ, recalling the crown of thorns that Jesus was made to wear, there were many other theologians who viewed the unburnt bush as a symbol of Theotokos who is “always a virgin, before, during and after the birth of Jesus Christ.” It was She who managed to contain the fiery nature of God the Son without being consumed: that was how St. Gregory of Nyssa, St. John Chrysostom, and Blessed Theodoret of Cyrrhus interpreted this passage. O Virgin, worthy of all praise: Moses, with prophetic eyes, beheld the mystery that was to take place in You, as he saw the bush that burned, yet was not consumed; for, the fire of divinity did not consume Your womb, O Pure One. (Octoechos, Tone 1, Monday Vespers, Theotokos Hymn on Apostikha). The Unburnt Bush symbolises the innocence of the Mother of God. She was born on earth to regular sinful people like us but remained pure and did not commit a sin nor accept wrongdoings. 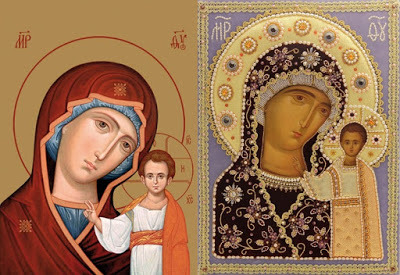 People started painting icons of the Mother of God the Unburnt Bush during the first centuries of the Christian era. The image of the Theotokos was placed inside a burning bush. 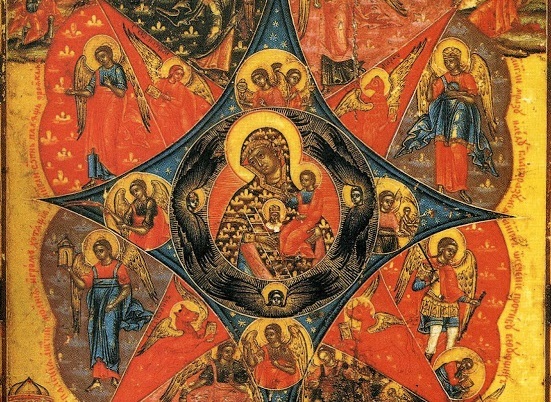 Most often, the image of the Theotokos belonged to Hodegetria (lit., She Who Shows the Way) type. The icon was becoming more complex over time: first, they added two crossed rhombi, a red one and a green or blue one. The red rhombus symbolizes the earth, while the green or blue one symbolizes the heaven. Red also means fire, while green points at the bush, which is burning yet not consumed by fire. Virgin Mary is portrayed with several symbols: a ladder (an Old Testament symbolic representation of the Mother of God, seen by Jacob in a dream) and a house (as the earthly Church). If we look at the rays of the stars that are formed by the intersection of the rhombi, we will see some angels — the rulers of the natural phenomena — in the rays of the first star (the blue one). There are symbols of the four Holy Evangelists as mentioned in the Revelation in the rays of the fiery-red star, namely, an Angel (Matthew), an Eagle (John), an Ox (Luke), and a Lion (Mark). Then there are angels (spirits of wisdom, reason, awe, and piety) and archangels in the two-lobed clouds. There are six archangels, each with his own sign: Michael, a rod; Gabriel, a branch of Annunciation; Raphael, an alabaster vessel; Uriel, a sword of fire, Selaphiel, a censer; Barachiel, a cluster of grapes. 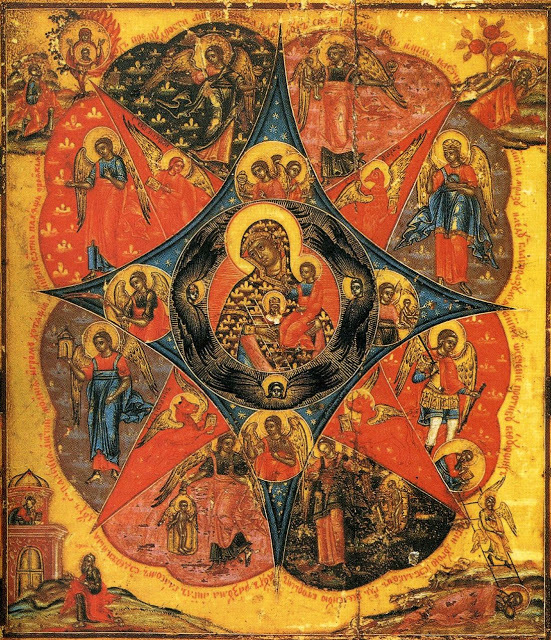 There are visions of the prophets in the four corners of the icon: the apparition of the Mother of God of the Sign to Moses in the Burning Bush; the apparition of a Seraph with a burning coal to Prophet Isaiah; the vision of locked gate to Prophet Ezekiel; and the vision of a golden Ladder with Angels to Jacob. The Unburnt Bush icon is a treasure of symbols. It appeared in Russia thanks to some monks who came from Palestine as pilgrims in 1390. 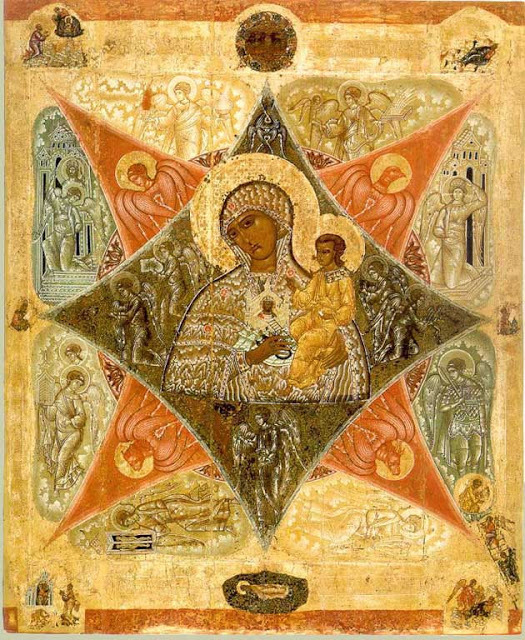 This icon is preserved in the sanctuary of the Holy Annunciation Cathedral of Moscow Kremlin nowadays. It was allegedly painted at the bottom of the rock where Moses had seen the burning bush. Many miracles happened thanks to people’s prayers to this truly wonderful icon. One of the most widely known miracles was the release of Dmitry Koloshin, who was Tsar Fyodor Alexeyevich’s stable man, from prison. The man was thrown into prison unjustly. He decided not to insist on his innocence; instead, he used the most powerful method: incessant prayer in front of the Unburnt Bush icon. The Mother of God appeared to the Tsar to inform him of his mistake and to demand the liberation of the innocent prisoner. 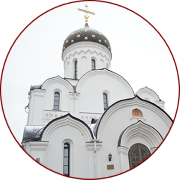 The gratitude of the freed groom was huge: Dmitry Koloshin built a church in honour of the Unburnt Bush icon of the Mother of God in 1680. This intricate image encourages us to get over our spiritual ignorance. It reflects the splendour and profundity of the Orthodox faith. 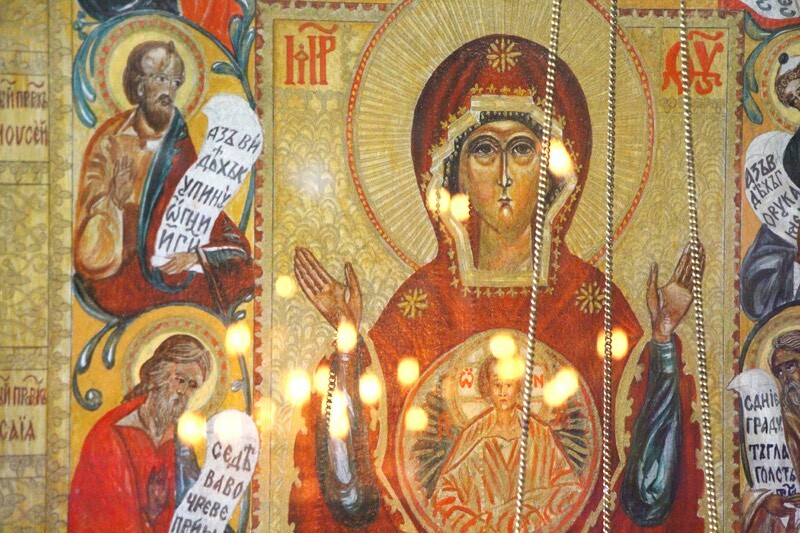 The icon of the Mother of God the Unburnt Bush shines like a jewel from the great treasure of the Orthodox faith.